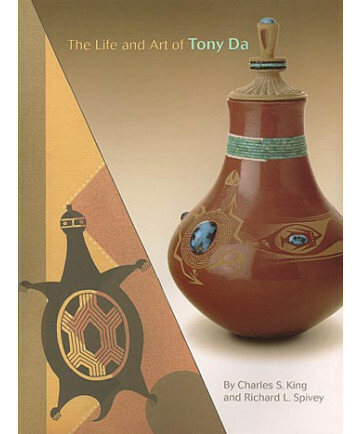 The Life and Art of Tony Da by Charles King and Richard L. Spivey "Charles King and Richard Spivey present the artwork and life story of Pueblo potter and painter Tony Da (pronounced "day") in this testament to his legacy. Da was both an art superstar of his time and a deeply private individual. 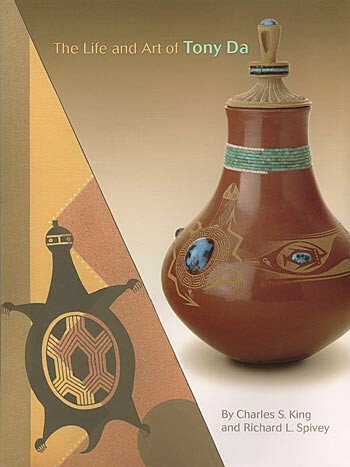 He came from a line of incredible artists in San Ildefonso Pueblo: his grandparents were Maria and Julian Martinez and his father was Popovi Da. Maria Martinez, known worldwide for her pottery, taught Tony how to work with the clay, and collaborated with him on a few pieces. Tony, a painter at heart, began creating pottery that would become famous and coveted among collectors. Breaking from traditional Pueblo pottery, his innovative pieces sent shock waves through the art world. Though his pottery commanded record prices, he always returned to painting, which he believed was the true fine art. Tony lived and worked with equal intensity. He loved his family but at the same time isolated himself in his art. Sadly, tragedy struck at the height of Tony's creativity, when he felt he was at the brink fo something extraordinary, and his genius was cut short. This intimate portrayal brings Tony Da's life, pottery, and paintings together for the first time in print." dustjacket Hard cover, 153 pages. Full color.